NeuroSuit offers customized intensive therapy sessions in the clinic in Pine Valley, California just 45 minutes east of downtown San Diego. The Intensive Program is 3-5 hours per day 5 days per week for 3 weeks. The program is customized based on individual patient need. The program is combined with a 30-60 minute hippotherapy session daily at Splash of Passion ranch in beautiful Pine Valley. NeuroSuit founder, Trisha Stotsbery, trained in Russia and Poland in intensive suit methods and developed the Intensive Model of Therapy (IMOT). Our Suit, called the NeuroSuit, actually frames the body providing support and resistance simultaneously. It improves and changes proprioception, reduce a patient’s undesired reflexes, facilitates proper movement and provides additional weight bearing distributed strategically throughout the body. This additional weight bearing provides strong feedback to the brain which helps create new improved patterns of movement, such as when walking, while the body is maintaining a more upright, correct posture. A patient diagnosed with cerebral palsy, post stroke, or other neurological disorder, requires hundreds of repetitions of any particular movement to learn or relearn missing skills. We believe that as individuals, we all have an unknown “specific” number. For example: a baby that is trying to push off the floor will need to repeat this movement a few dozen times in order to master it. Yet, another one may need either more or less repetitions to learn the same skill. For the person with a neurological disability, however, this fairly low “specific” number grows to hundreds of repetitions to learn and master new skills. This is one major component of the Intensive Model of Therapy (IMOT) designed to allow ample time to increase repetition of skills. The NeuroSuit worn over prolonged time during intensive therapy can help correct disrupted motor patterns and accelerate progress, such that in physical movement the skills practiced will become more fluent and require less effort. In the NeuroSuit Intensive Suit Therapy Program, individuals often make significant progress in just 3 weeks of Intensive Therapy often equaling what they would gain in an entire 12 months of traditional therapy. With the highly skilled therapists on staff at NeuroSuit combined with the tools of the IMOT program, most children achieve rapid results in a short burst of time. It doesn’t stop there! 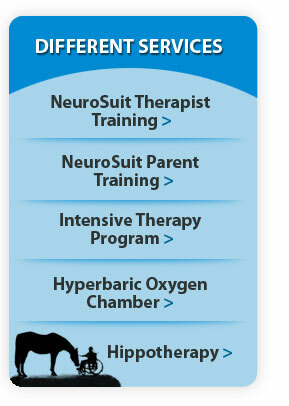 During the 3 week intensive session, parents or caregivers have the opportunity to purchase the NeuroSuit and receive free training for continued use at home with a detailed home exercise program given with each session. Once you attend our program you become like family. You can stay in contact via the forum on our website, email or phone for continued consultation or simply for encouragement from other families.